. 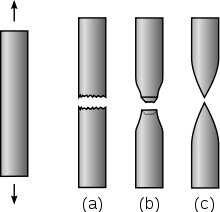 The ductility of steel varies depending on the alloying constituents. Increasing the levels of carbon decreases ductility. Many plastics and amorphous solids, such as Play-Doh, are also malleable. 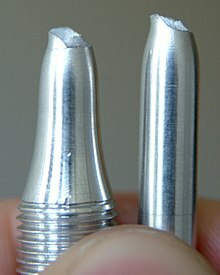 The most ductile metal is platinum and the most malleable metal is gold. When highly stretched, such metals distort via formation, reorientation and migration of dislocations and crystal twins without noticeable hardening. ^ a b Budynas, Richard G. (2015). Shigley's Mechanical Engineering Design—10th ed. McGraw Hill. p. 233. ISBN 978-0-07-339820-4. .
^ "Ductile". TheFreeDictionary.com. Farlex. Retrieved January 30, 2011. Includes definitions from American Heritage Dictionary of the English Language, Collins English Dictionary: Complete and Unabridged, American Heritage Science Dictionary, and WordNet 3.0. ^ Masuda, Hideki (2016). 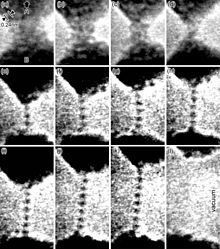 "Combined Transmission Electron Microscopy – In situ Observation of the Formation Process and Measurement of Physical Properties for Single Atomic-Sized Metallic Wires". In Janecek, Milos; Kral, Robert. Modern Electron Microscopy in Physical and Life Sciences. InTech. doi:10.5772/62288. ISBN 978-953-51-2252-4.